WHAT IS A SOLAR GRID-TIE INVERTER? A Grid-Tie inverter supplements your mains utility power with solar power. In order to achieve this the electricity produced by your solar panels is converted from direct current (DC) to alternating current (AC) by the grid-tie inverter. The inverter then synchronises the two power sources and supplements the mains utility with the solar power. The advantage of this system is that you can drastically reduce your mains utility bill through solar power. This type of system unfortunately does not function if it does not have mains electricity to synchronise with and therefore cannot be used as a backup system. If you're looking to cut costs and have a backup option you need to have a look at the Hybrid Solar Inverters here. An important point to consider when buying a grid-tie or on-grid solar solution is whether it is possible to feed electricity back into the grid (legally). If this is an option your can reap the reward of further savings by supplying excess power to the mains utility grid and recieveing credits from your utility provider. If this isn't possible in your area, then you should be sure to purchase a grid-tie inverter with export controls that allow you to disable the feedback into the grid. This system is ideal for businesses who use most of their electricity during the day. The system allows for self-use consumption when you use most of your electricity. Grid-Tie, Grid-Tied and On-Grid are all used interchangeably to describe the same system described above. 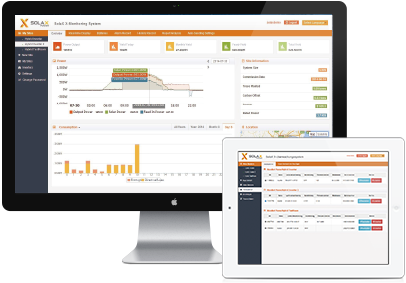 Remotely monitor your energy usage using the built in Wifi or Ethernet using the free dashboard.